Lionel Messi's astonishing brace ensured Barcelona would head into the second leg with a three-goal aggregate lead after breaking Bayern Munich's incredible resistance late on. The Nou Camp roared in anticipation of Pep Guardiola's emotional return to his old home, but this time with German heavyweights Bayern Munich alongside him. Could they do the unlikely and grind a result out of the in-form Barcelona? Well, they certainly intended to. Guardiola's men audaciously pressed high up the pitch and deployed an attacking style of play. Only the Germans would do this away at the Nou Camp. Suarez latched onto a slick ball, scampered past Boateng into the area until the Uruguayan fell to the ground appealing for a penalty. Nicola Rizzoli shook his head as an adamant Suarez continued his claim. The former Liverpool striker would then find himself in on goal, with only one defender to his right, struggling to keep up with him. Suarez struck at goal, but Neuer plunged down low to deny his man. Both sides were striking big blows early, and Bayern approached the game with man-to-man marking. It made for a terrific opening ten minutes, but surely they couldn't have sustained that. Suarez was looking dangerous in the first quarter of an hour, and he continued to. Drifting past Boateng on the right byline, he cut-back to Neymar who looked almost certain to tap home but a vital block by Rafinha prevented the Brazilian from opening the scoring. Bayern would then press high, as Muller zigzagged in between two defenders on the right hand side of the area. He cut a superb ball through to Lewandowski just a few yards unmarked, but the Pole failed to get clean contact on his effort and he sliced the ball away at close range. Messi displayed more of his incredible magic, and weaved in-and-out of Alonso, then Thiago but his curling left-footed strike would roll past Neuer's far post. Both sides settled down once twenty-five minutes passed; with possession being a key factor. Once Barcelona retrieved it though, they looked dangerous moving forward. Alba's terrific run down the left, then promising cross was crucially intercepted by Boateng as the Nou Camp's volume continued to increase. There is nothing quite better to watch than Barcelona's amazing link-up play. Once again, they almost scored after it. After a sequence of short, quick-fire passes, Iniesta looped a ball over to Dani Alves who brought it down, struck at goal but once again Neuer got down well to keep the solid effort out. Lewandowski made a quick start to the second half; blistering past Alves until he was bundled over by his Brazilian opponent. Alonso would hit the wall on the free-kick. Bayern were passing the ball around well and almost had Barcelona pinned in their own half. Muller and Lewandowski made superb movement in and out of the defenders; finding plenty of space. However, when the hosts did attack they looked intent and Bayern were up against it. Messi and Suarez were linking up well. Neymar would also chip in as he received possession on the edge of the box, but his effort skied over Neuer's crossbar. More link-up play would almost break Bayern's resistance, though, as Neymar found himself clear on goal. Messi initially chipped over to pick him out, but Neuer fantastically anticipated the pass, scorched out of his box and battered into Neymar; clearing the ball well while he was at it. Compared to the earlier tempo, it had calmed down massively but to say it was still at a high pace proved how rapid both sides were going in the first half. After all of Bayern's resistance, there only had to be one man to break it. To be fair, the deadlock was broken by the visitors' sloppiness. Alves easily dispossessed Boateng on the right, strode forward, knocked it to Messi outside the area who fired a low shot at goal and beat Neuer who was helplessly beaten at his near post. The Nou Camp obliterated in pure celebration. 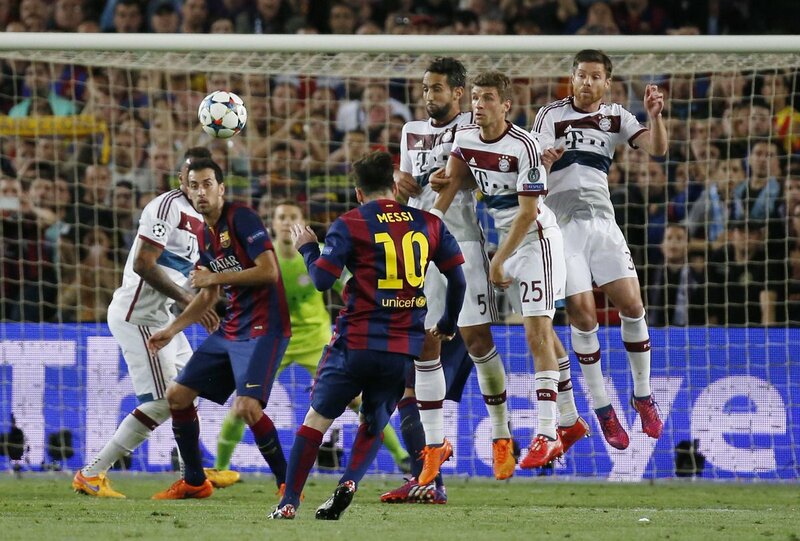 However, just moments after that, Messi unbelievably struck again. Bayern were bewildered by such class. The Argentine retrieved possession outside the area, took a couple of lightening strides, saw Neuer coming off his line and chipped the German goalkeeper with his weakest foot. The visitors could only watch in shock as the ball leaped into the back of the net. Absolutely incredible. Bayern pushed up the field seeking an away goal and paid the ultimate price. The ball was hoicked forward from a goal kick, and with the visiting defenders at the half-way line, Messi retrieved possession and put Neymar clear in on goal. The Brazilian blistered forward and tucked past the helpless Neuer; topping a three-goal wrecking late on. 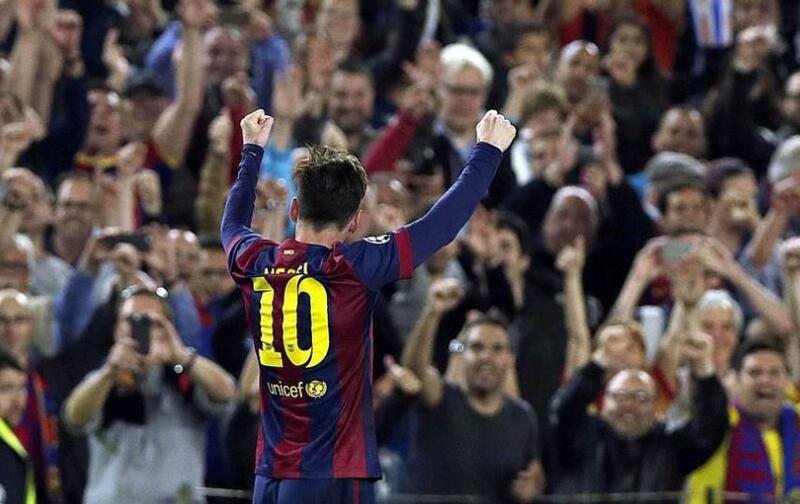 A magical performance from Lionel Messi sees Barcelona destroy Bayern Munich in the Champions League semi finals.